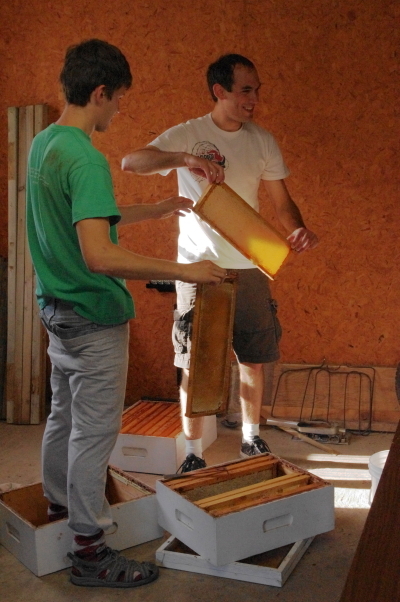 oe and his girlfriend Eryn came up this weekend to harvest the honey in his hives. Dan has been bitten by the beekeeping bug and joined in on the fun. Bees apparently like light colored clothing and are less likely to sting if you are wearing white or light colors. This is why Dan has tried to shimmy into his fiancee’s pants over his jeans. Eryn and I were quite amused. Note how his socks are tucked over his pants so bees cannot fly up his pant legs. After pulling the supers off, the bees are gently blown off the frames with a vacuum cleaner switched to reverse. When the super is bee-free it is set inside away from the hive. 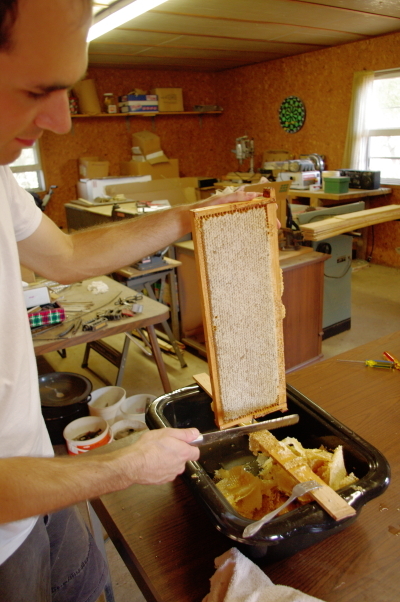 Joe pulls a frame at a time out of a box and cuts the thin capping layer of beeswax off the honey comb with a serrated knife. Some beekeepers use electrically heated knives to do this, but Joe prefers an unheated knife. After the comb is uncapped the frame is slid into a slot in the extractor, which is a large centrifuge that spins the honey out of the comb. 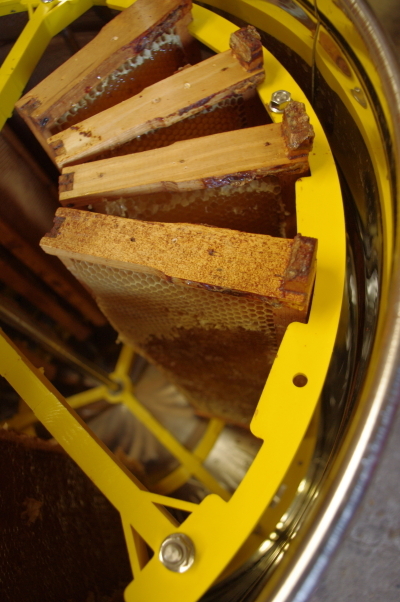 There is space at the bottom of the stainless steel drum for the honey to pool. The frames are loaded evenly so that the weight is as balanced as possible. 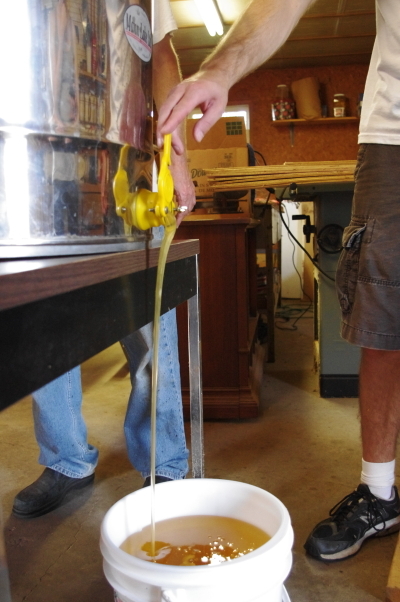 When the extractor is full it is set up on a table at a little bit of a tilt and the gate on the spigot at the bottom is opened to remove the honey. 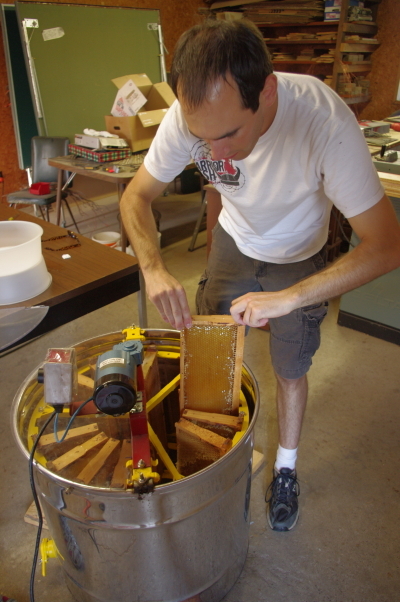 A screen is seated into a five gallon pail to clean the honey. 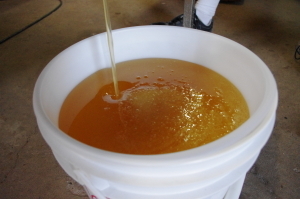 Honey is anti-bacterial in nature because of it’s high sugar content, Joe does not cook or pasteurize it. The bees drop the water content of the honey after it is the comb by fanning it with their wings. When the honey is roughly 17% water and thus stablized from bacterial growth, the comb is then capped by the bees. We also took some excess propolis off the hives when we had them apart to try a recipe for liquid bandages that I will share soon. At right is a picture of a man giddy with his honey haul. He got about 6 gallons off the one hive, but unfortunately it is all already spoken for. If he has some available in the future I will let you know. This entry was posted in Beekeeping, DIY!, Food and Gardening. Bookmark the permalink.